The Laboratory is primarily concerned with science and technology applications which necessitate the simultaneous consideration of two or more states of matter, multiple materials and several physical and chemical processes. To this end, at the core of our work is the development of numerical methods for the direct numerical simulation of an arbitrary combination of four states of matter (gas, liquid, solid and plasma). Our approach is suitable for the numerical simulation of nonlinear problems involving any combination of four states of matter. Problems involving more than one state of matter, such as solid-fluid interaction, are usually modelled by means of coupling finite element and CFD codes. The two processes are solved in a 'co-simulation' environment, each on its own grid, with a distinct numerical method. This approach works well for many problems, but it may lead to discretisation errors passing from one method to the other and it is not easy to extend to general systems with many different states of matter, especially for highly nonlinear problems. Our work takes a different approach where the governing equations for an arbitrary combination of states of matter are solved simultaneously and on the same regular Cartesian mesh, implemented in a structured, hierarchically adaptive mesh-refinement framework. All the systems of equations considered in our multi-physics applications are first cast in the same mathematical form. Thereafter they can be solved on the same grid and using the same numerical method (finite volume). The interfaces between different materials are embedded within the Cartesian mesh using level set methods. We use the Riemann ghost fluid method and appropriately derived mixed-material Riemann problem solvers to apply material boundary conditions. Our technique can be applied to simultaneously simulate four states of matter; gas, liquid, solid, plasma. 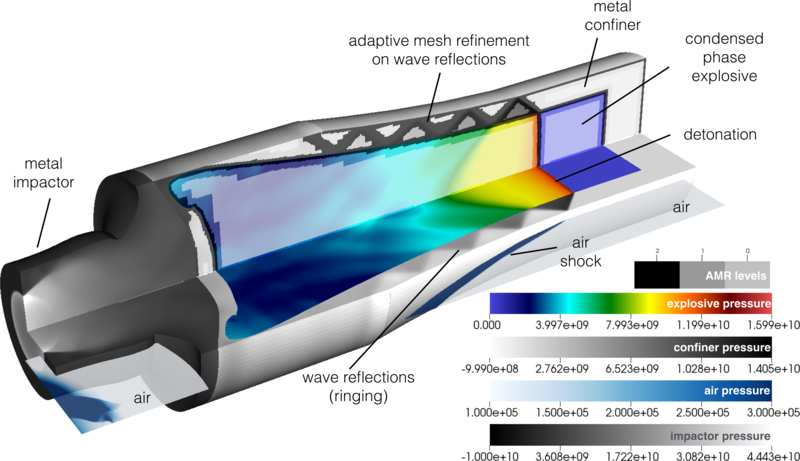 This is an example of a high-speed impact involving multiphase reactive flow (condensed phase into gas), structural elastoplastic response and inert air response. The vessel and impactor are modelled by the elastoplastic equations and the explosive by the MiNi16 formulation (Michael and Nikiforakis 2016). The impact generates a detonation in the explosive. The interaction of the detonation wave with the copper generates wave reflections at the inner and outer vessel walls and thus waves are transmitted into the air and back into the explosive, see Michael and Nikiforakis (2018). 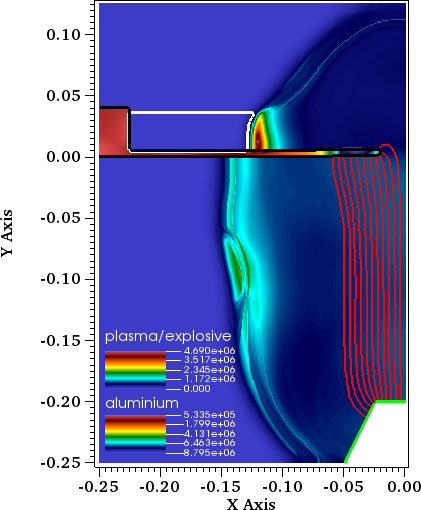 In this example, which is akin of laboratory experiments of lightning strike on an aircraft wing, we simulate the interaction of a cylindrical plasma-arc with a vessel containing a flammable gas. The pressure waves induced by the plasma arc, ignite the flammable gas, see Michael, Millmore, and Nikiforakis (2018). An Eulerian algorithm for coupled simulations of elastoplastic-solids and condensed-phase explosives, Schoch S., Nordin-Bates K. and Nikiforakis N.. 2013., Journal of Computational Physics, Volume 252, Pages 163–194. The propagation of detonation waves in non-ideal condensed-phase explosives confined by high sound-speed materials, Schoch S., Nikiforakis N. and Lee B.J., 2013. Physics of Fluids, Volume 25, Issue 8, http://dx.doi.org/10.1063/1.4817069.